All arrangements are by Raf Robertson except PANORAMA NIGHT by Frankie McIntosh & Raf Robertson, and the PAN IN HARMONY introduction by Clive Bradley. All songs are composed by Aldwyn Roberts except PRELUDE IN A MINOR by Raf Robertson. Raf Robertson tells us in the booklet text "this album is the result of [a] lifetime love affair with the music of the great Lord Kitchener. It took a year to complete, research to production. I had the most fun ever doing it and I am grateful. Thank you, Kitch." We thank him, too. Raf is to be highly commended for this seminal work first released in 1994. It's a testimony to Raf's vision, and West Indian pride, that he would conceive of such a recording and then assemble a cast of accomplished musicians to record it. The list of musicians includes a number of highly capable artistes who are more popularly associated with other genre. Two such are Clive Bradley of steelband Panorama fame and Frankie McIntosh an all-rounder in calypso, soca and jazz. All the interpretations are based on a West Indian master's compositions. No need to leave home, as it were, to get inspiration. 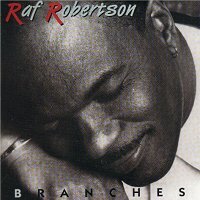 Kitch is more than a grandmaster; he is a muse and that is acknowledged by Raf Robertson in Branches. The title track Branches, and Pan In a Minor summon you to pay attention. Iron Man and Margie are in a Latin beat and therefore you want to dance. Pan In Harmony is the calypso jazz interlude and it is followed by Panorama Night, a combination acappella kaiso and jazz blend in a Sarah Vaughn like styling. We can do with more of Liberty Silver's singing. Perhaps, next time.